"The importance of my experience at St Pat’s, as well as at Holy Family HS and the University of Notre Dame afterward, seems in retrospect to have been that life is an holistic experience, full appreciation of which is difficult to achieve while treading narrow paths. Second only to my family, St. Pat’s was the original foundation of my relative ability to experience life broadly, interact with others, and maintain the notion that being known as a decent person is the highest of honors. The brick building on the corner of Main Street and Woodbury and my friends therein have returned to my thoughts many times in the last 40 years." John hails from a traditional Irish Catholic family, being one of six siblings. 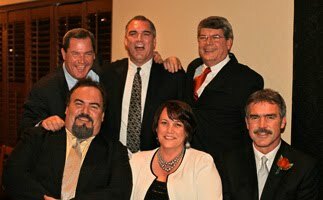 All his siblings graduated from St. Patrick's: Tim 1971, Dan 1973, Cathy 1975, Mike 1976, and Peter 1978. His parents Jack and Mary (RIP) Scully were active members of our Parish, with Jack entertaining the Parish with his voice both in and out of the choir. John attended St. Pat's from 1964 through 1972. While St. Pat's did not have a football team, John was already fine-tuning his football skills wrestling with his brothers. Eyewitnesses are still amazed that the Scully house withstood the punishment. John also took piano lessons from Marga Richter, a graduate of the prestigious Juilliard School in New York. She applied the seriousness of that school to her lessons, Scully said. "In retrospect, it was a great thing, but it was not a lot of fun at the time," he recalled of studying classical music with Richter from 3rd grade through his freshman year in high school in 1972. "That gave me my initial grounding in music as to what things were supposed to sound like and the building blocks of music." John attended Holy Family from 1972 to 1976. In its glory years, Holy Family was a football powerhouse, and John's play at offensive tackle was a cornerstone for their best teams. He helped lead the Chargers to an undefeated 1976 season that stands out in school history. Seeing John pull and lead block on a long run was something to watch. John's next stop was the NFL. 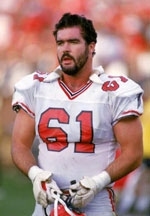 The Atlanta Falcons chose John in the fourth round (109th pick overall) of the 1981 NFL Draft, and he played for the Falcons from 1981 to 1990. In his ten-year NFL career, he played in 112 games and started eighty-two of them. For those of you who know your NFL history, Steve Bartkowski and Deion Sanders were among John's teammates. After football, John picked up his music career. He co-wrote "Here Come the Irish", which has become a standard for Notre Dame fans, ranking just behind the Notre Dame Victory March and Notre Dame, Our Mother (alma mater). With this link you can see John perform "Here Come The Irish." John also enjoys great success and happiness in his personal life. He married his college roommate's sister, Annette. 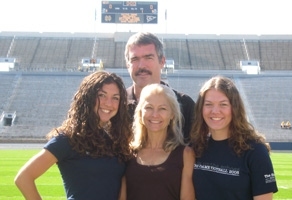 They are blessed with two daughters, Annie and Britt, both recent graduates of Notre Dame. They live in Joliet, Illinois, where John works in the insurance business. We congratulate John on his success and wish him and his family all the best. John is hoping to attend the 90th reunion next summer. You can read more about John in the following articles.